Above is a photo of the Holy Mother of God Icon that weeps tears of Holy myrrh. January 3, 2017 - Reported [here] from [here] and [here]. Video [here]. 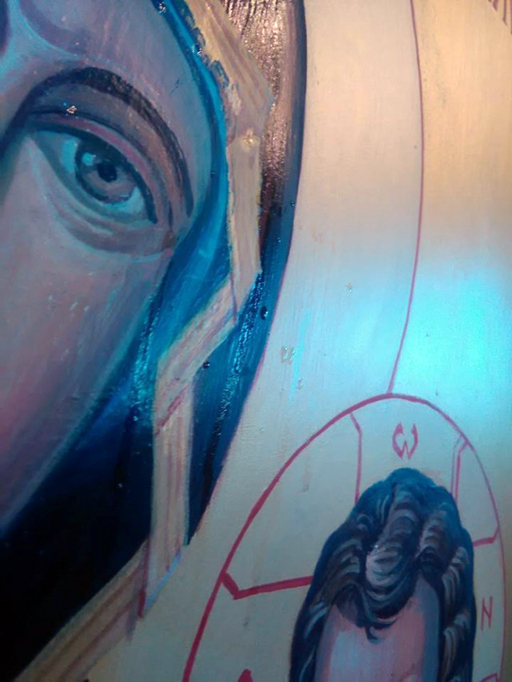 Visitors are flocking to a tiny village church after worshippers reported seeing tears coming from the eyes of a painting of the Virgin Mary. It is the second time in less than a year that the phenomenon has been reported at the Church of the Holy Archangel Michael in the village of Trubarevo near the Macedonian capital city of Skopje. Witnesses said that the latest tears were first spotted on New Year's Day - exactly a week before Orthodox Christmas which is celebrated on January 7. Worshippers spotted the teardrops and pointed them out to their priest who has contacted Macedonian Orthodox Church officials asking them to confirm the miracle. It comes less than nine months after tears were spotted on the same icon in April - just before Easter. Scientists, as well as Christians, then came from far and wide to see the phenomenon for themselves. Tears from an icon are generally interpreted by believers as a sign or warning of a future event. Risto Setinov, the president of the local church board, said: "When the priest finished his Sunday morning service, one believer noticed a few drops coming from the left eye of the Virgin. "Father Boban took some wool and wiped it, smelt it and said it smelled of Holy myrrh. After that, a few more drops came down the face of the icon. "We remained in the church all day and the drops kept appearing." The news of the miracle has been reported to Archbishop Stefan Veljanovski, the head of the Macedonian Orthodox Church. Archbishop Veljanovski reportedly prayed in front of the icon and said that he believed the tears were a sign from God.